The answer to “what is prayer?” can be found in the five ways Christian prayer moves between God and us. The five prayer movements are personal prayer, group prayer, meditation, intercessory prayer and outpouring prayer. The first part of the answer to “what is prayer?” is personal prayer where conversation moves between God and yourself. In this type of prayer, the movement takes place when we say things to God and he sends ideas and thoughts back to us. You might picture this as an arrow going up to God and an arrow coming back down to you. Most of us can naturally pray and talk to God because we know how to talk to other people. However, having a conversation also involves hearing the other person’s viewpoint and listening to their replies and ideas. 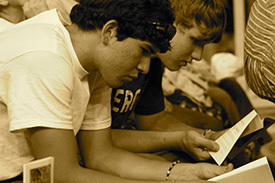 To make personal prayer more conversational and interactive we look for responses from God. Usually God’s responses come to us in natural feeling ways. Circumstances might change. We might recall wisdom from the Bible that has bearing on our situation. We might get an answering thought. 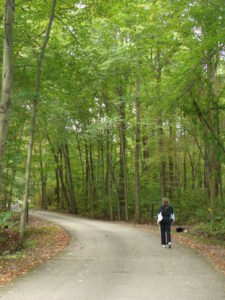 We might later find a new outside resource, like information or a new treatment or medication. We might receive good advice from another person. Even when things don’t change or we don’t get new ideas or direction, we can still find powerful responses from God by sensing his care, presence and concern. We might feel this directly during or after prayer we feel more at peace or encouraged. Or God might send someone to you to encourage and support you. 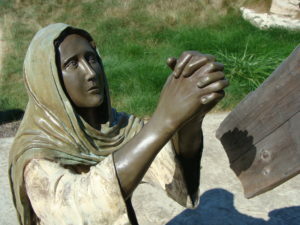 During personal prayer we can ask for God’s intervention or help in changing circumstances, confess our sins and receive forgiveness, ask for direction, seek new vision or our life purpose, uncover insights into our emotions and reactions, find freedom from our past, gain help in overcoming our bad habits and learn how to get along with others. The second part of the answer to “what is prayer?” is group prayer where two or more individuals pray together. 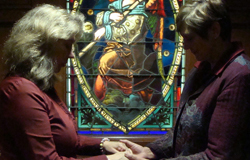 In this type of prayer, the movement takes place in a number of different directions. In it, we talk to God and God responds to us like in personal prayer. In addition, there is at least one other person also engaging with us in this back and forth conversation with God. And finally, there is an added dynamic of sharing back and forth between the people praying together. Group prayer adds the dimension of allowing God to deliver his messages through someone else’s heart, mind and spirit. This allows God to not only work directly with you in response to your prayer but also to work through another person. 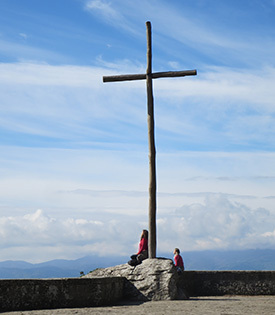 They might have a word of insight to share with the group, or the words of their prayer might be surprisingly specific and comforting in ways that only God can inspire. 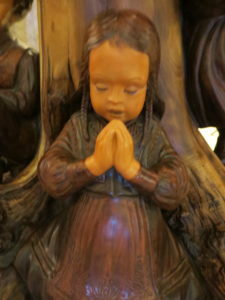 Also, during group prayer more subjects can be covered in greater detail. 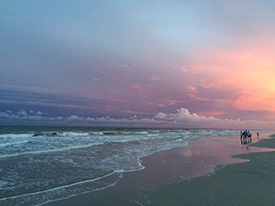 A third part of the answer to “what is prayer?” is meditation, praise and thanksgiving. In this type of prayer, I picture prayer as moving in an upward direction toward God. God remains who he has always been and we simply make the conscious effort to move away from earthly matters and closer to him. In this type of prayer, we’re not making requests for ourselves or others or trying to solve problems. We simply draw closer to God in order to worship, love and adore him. This type of prayer can be very filling and satisfying because we are rising above earthly things and focusing on God’s beauty, splendor and praiseworthy characteristics. Instead of focusing on negatives, we are thanking God for the ways he has cared for us and blessed us. While meditation can refresh our minds and give us new insights, most typically the results are on a more intuitive level in our hearts and emotions. Afterwards we might feel a sense of peace or wellbeing. That’s why the experience and results usually can’t be put into words. Although meditation can be done in a group setting, the actual experience is very individualized and personal. A fourth part of the answer to “what is prayer?” is intercessory prayer or making requests and asking God for specific help for others. This type of prayer is what most people think of as the answer to “what is prayer?” Typically, many prayer groups in churches and other organizations pray for requests and specific needs. And we also we tend to pray more often and ask others to pray for us when we are in situations that are out of our control. The direction intercessory prayer moves is similar to the prayer dynamics of personal prayer and group prayer. However there’s an added element – we may be praying for a third party who’s not part of the current prayer circle. The person who is the recipient of our prayers may not even be present at all. So we add on another person in need to our diagram and an arrow that goes directly from God to that person. Through intercessory prayer we can pray for people on the other side of the world or someone in your own family in the next room. The sky is limit when it comes to what subjects can be covered in intercessory prayer. We can pray for God’s intervention in large world concerns, unjust situations, serious illness, salvation, bereavement, spiritual growth, unity, guidance, protection and for God’s strengthening presence in someone’s life. A fith part of the answer to “what is prayer” is outpouring prayer or revival. In this type of prayer God supernaturally pours out a spirit of prayer onto individuals or onto groups of individuals. In this type of prayer, the direction of prayer moves from God downward to people through an outpouring of the Holy Spirit. This outpouring or revival answer to “what is prayer?” is not often mentioned because it’s not a type of prayer we initiate. God is the one who sends this unusual prayer flow and force, often quite suddenly and unexpectedly. From what I’ve learned from researching this type of prayer, it seems to come in a particular place and time according to God’s will and plan. Often people are gathered together. They may have been praying for help or revival. Suddenly everyone is overcome with an intense feeling of God’s actual presence in that particular place. The response is a strong emotional one that expresses itself in prayer. Often the prayers that flow through them are prayers of personal conversion and repentance, or praise or bold intercession. More historical examples of prayer as outpouring or revival include the 100 Year Prayer Meeting which began in Hernhut Saxony in 1727. 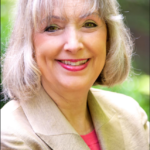 I personally benefited from this event because I grew up in the Methodist church, which was established when the founder of Methodism, John Wesley was empowered by the results of this outpouring of prayer. And if you live in the United States, it’s probable that someone in your family tree was affected by the Fulton Street Revival prayer meeting in 1857 in New York City. The Fulton Street Revival swept the country and some estimates say that as a result 3% of the US population was converted. When I first began putting together my ideas on prayer, someone asked me a good question that led me to come up with the five movements of prayer. I was teaching an adult Sunday school lesson on how to make prayer interactive. I was about half way through the lesson when a woman raised her hand and asked, “Are you talking about personal prayer or group prayer?” “Personal prayer,” I answered, realizing that I was focusing my lesson on us talking directly to God all alone and him responding to us. Later I started wondering how group prayer was different than personal prayer. I realized then that it would be helpful to more precisely define different types of prayer so that when I talked about prayer with other people they would know immediately what I was talking about. 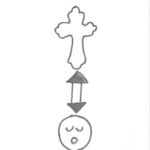 My drawing of the personal prayer model. When I’d gathered my thoughts on personal prayer, I had drawn arrows to show how the give and take happens with God. I drew a smiley face at the bottom to represent and individual, then a cross above it to represent God. I had drawn two arrows. One going up from the person praying and another going down from God in response to their prayers. 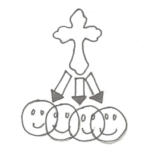 My drawing of the group prayer model. I sat down and tried doing the same kind of arrow model with group prayer, this time adding a second person next to the first one. When I started drawing I had so many more arrows to put in – not only arrows up and down between each person and God but also arrows back and forth between the two people praying. 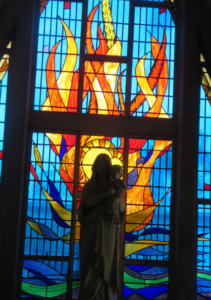 When I was finished I was stunned to realize how the dynamics changed dramatically by adding a second person to the prayer diagram to represent group prayer. Instead of the two arrows I’d drawn for personal prayer, there were now six arrows through which to prayer requests and responses could travel! 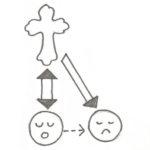 Intrigued, I continued doing arrow diagrams to represent meditation and intercession. Each one had completely unique arrow configurations. 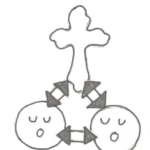 My drawing of the meditation/praise prayer model. When I drew my diagram of meditation and prayer, I decided to draw it with a single arrow going up from us toward God. I did this not because it’s a one way conversation but rather because in this movement of prayer, we’re moving closer to God and he simply stays where he’s always been. My drawing of the intercession prayer model. When I drew the diagram for intercession, I added another person to the picture beside us and drew a dotted line between us because often we are not actually with the person praying and sometimes we might not even know them personally. In this case, I added a direct arrow connection arrow between God and the person for whom prayers were being lifted. 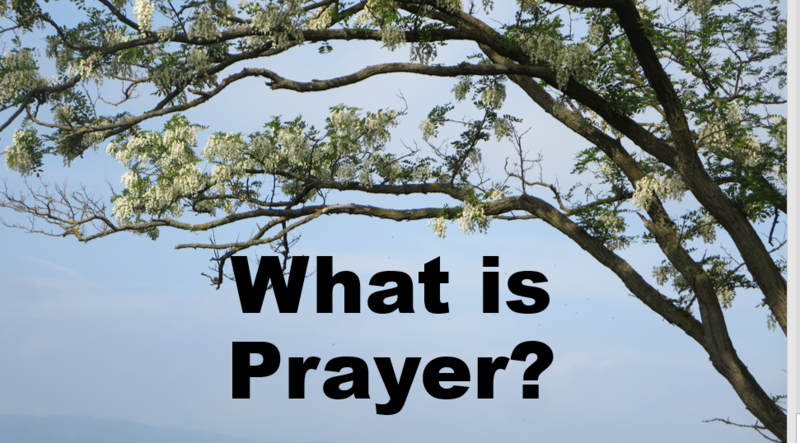 After I had these four movements of prayer pictured, I found that they helped me a great deal when talking about “what is prayer?” because they seemed to explain the main ways that we experience and practice prayer. My drawing of the prayer as outpouring model. It was more than a year later that I was surprised when a final thought came to my mind that I’d never had before – prayer as outpouring or revival. I researched it in the Bible and also in history and saw that it was another prayer movement that could be pictured with my simple arrow diagrams. In this prayer movement, I pictured a number of people side by side at the bottom and God sending as an arrow down to each one of them. In this mode of prayer, God was the unexpected initiator. Since then I have used the concept of the five movements of prayer whenever I am teaching about prayer and my listeners always find it helpful.